The main difference between memory and storage is that the memory is the component in computers that stores data for a short-term access while the storage is the component in computers that stores data for a long-term access. Furthermore, the memory refers to Random Access Memory (RAM) and storage refers to secondary memory. Memory and storage are two terms in computing that are used interchangeably. But they have a difference. Both of them are components of a computer system. Memory, or the RAM, stores data temporarily and helps to determine the speed of the system. On the other hand, the storage, or the secondary memory, stores data permanently. Moreove, the memory is volatile whereas storage is nonvolatile. Storage allows the processor to transfer its data to the memory for short-term access. Memory refers to the component in a computer that allows short-term data accessing. Usually, memory refers to Random Access Memory (RAM). Memory installed on to the computer is a considerable factor in determining the speed of the system. Moreover, memory stores data temporarily. The data will erase when the device loses power. Therefore, it is a volatile memory. The processor accesses the data available in the memory to run programs, edit files and to switch between various applications. Overall, it is a vital component for the proper functioning of the device. Storage refers to the component in a computer that allows long-term data accessing. Storage refers to hard disk or Solid State Drive (SSD). The data in storage is permanent. Powering off the device will not affect the data in storage. Even though the user shut off the computer several times, the data remains as it is. Therefore, it is a nonvolatile memory. This component allows users to store and access files and applications. The processor transfers the long-term data stored in the storage to memory for short-term access. Memory is a physical device in a computer that is capable of storing data temporarily. Storage is a physical device in a computer that is capable of storing data permanently. 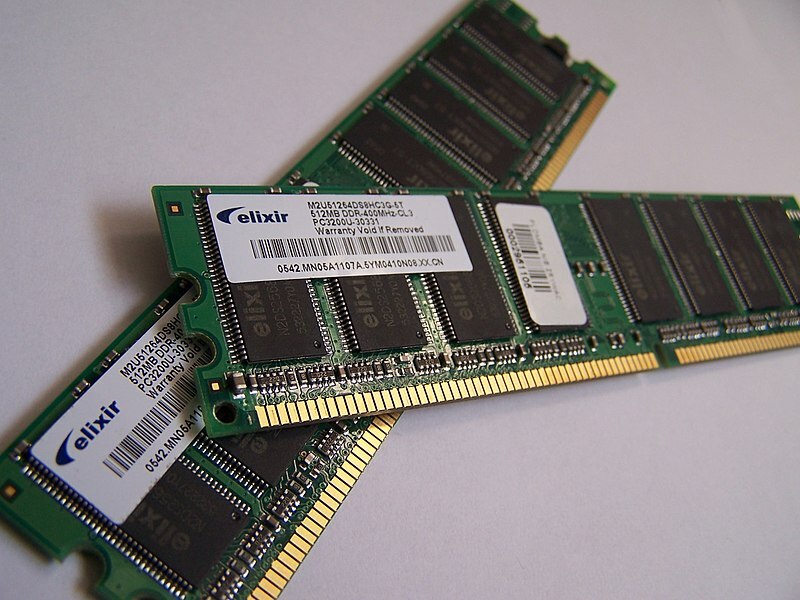 Memory usually refers to Random Access Memory (RAM). 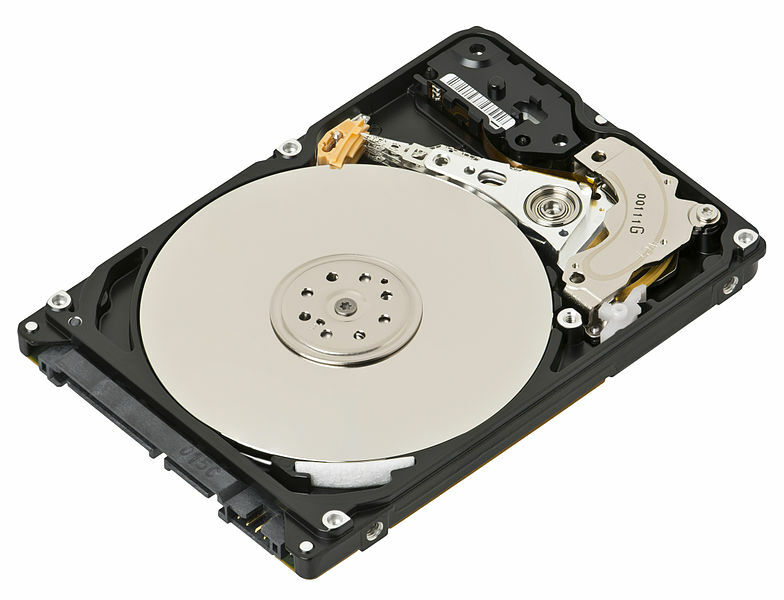 Storage refers to computer hard disk or Solid State Drive (SSD). The data in memory will be erased when the device loses power. On the other hand, the data in storage will remain even when the device does not get continuous power. Memory is a volatile memory while storage is a nonvolatile memory. The memory allows the processor to access data to run programs, edit files and to switch between various applications. The storage allows storing and accessing files and applications. It allows the processor to transfer its data to the memory for short-term access. Memory allows the user to access data that is stored for the short term. Storage allows the user to access data that is stored for the long term. Memory is fast, but storage is slow. 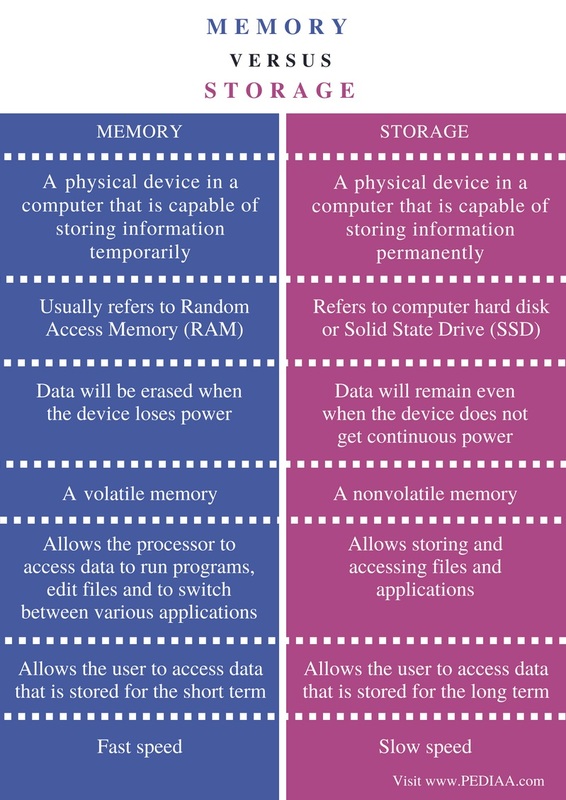 The difference between memory and storage is that the memory is the component in a computer that stores data for short term access while the storage is the component in the computer that stores data for long term access. 1. Memory & Storage: Crash Course Computer Science #19, CrashCourse, 5 July 2017, Available here.